View or download the PDF (1 MB). 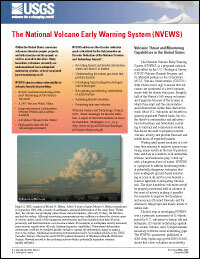 The National Volcano Early Warning System (NVEWS) is a proposed national-scale effort by the U.S. Geological Survey (USGS) Volcano Hazards Program and its affiliated partners in the Consortium of U.S. Volcano Observatories (CUSVO) (http://www.cusvo.org) to ensure that volcanoes are monitored at a level commensurate with the threats they pose. Roughly half of the Nation’s 169 young volcanoes are dangerous because of the manner in which they erupt and the communities and infrastructure within their destructive reach. Most U.S. volcanoes are located on sparsely populated Federal lands, but it is the threat to communities and infrastructure downstream and downwind, including to military and commercial aviation, that drives the need to properly monitor volcanic activity and provide forecasts and notifications of expected hazards. Waiting until unrest escalates at a volcano then reacting to improve sparse monitoring arrays results in the loss of precious time and data as scientists, civil authorities, citizens, and businesses play "catch up" with a dangerous force of nature. NVEWS is a proposal to address monitoring needs at potentially dangerous volcanoes that have inadequate ground-based monitoring or none at all and to move beyond a reactive approach to mitigating volcanic risk. The most hazardous volcanoes would be properly monitored well in advance of the onset of activity, making it possible for scientists to improve the timeliness and accuracy of hazard forecasts and for citizens to take proper and timely action to reduce risk. The first step in developing NVEWS was a systematic assessment of (1) threats posed by U.S. volcanoes to human life and enterprise, (2) current monitoring capabilities at each volcano, and (3) improvements necessary to fill the worst monitoring gaps. The NVEWS assessment, published in 2005 (https://pubs.usgs.gov/of/2005/1164/), shows that a few volcanoes are relatively well monitored with telemetered instrument arrays of various types. Many other volcanoes are monitored primarily by a network of sparsely distributed seismic instruments that lack the sensitivity to detect the subtle earthquakes that commonly characterize the earliest stages of unrest. Some hazardous volcanoes have no ground-based monitoring whatsoever. The overall result of the NVEWS assessment is the identification of 57 priority volcanoes that are undermonitored for the threats posed and thus targets for improved monitoring networks.